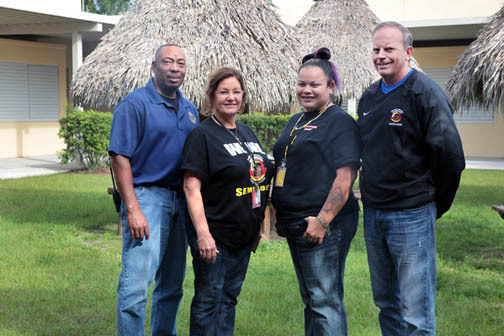 BRIGHTON — Pemayetv Emahakv Charter School recently named its 2014-15 teachers and non-instructional employees of the year. Every year, teachers and staff nominate and vote on those individuals they believe exemplify the high standards of the school. “We have fantastic teachers this year; I’d select either one for district teacher of the year,” said PECS principal Brian Greseth. The teachers were finalists for Glades County District Teacher of the Year, and during the Jan. 21 ceremony, PECS Middle School Teacher of the year Tom Finney won the honor. Finney joins two other PECS teachers to have earned the distinction in the past five years. A veteran math teacher with 25 years of experience teaching middle school students, Tom Finney thinks outside the box to keep students interested in the subject. Every year Finney’s students use math to build a scale model of a real place. In years past, students made models of the Golden Gate Bridge, Washington, D.C. and a football stadium. This year, they will create an NBA basketball arena by using math to accurately scale it to fit inside the classroom. After graduating from the University of Minnesota, Finney began his teaching career at Yearling Middle School in Okeechobee before joining PECS five years ago. Born and raised in a small town, Finney prefers the small school environment of PECS. Working at the Charter School gives Finney a chance to interact with elementary teachers and review their lesson plans, which isn’t typical for middle school teachers. He teaches seventh- and eighth-grade math classes and enjoys teaching students for two consecutive years. Finney’s students have consistently showed some of the highest eighth-grade growth percentages on the FCAT Math Assessments in the Heartland Consortium. Over the last three years, Finney has been the only Algebra 1 teacher in the Heartland Consortium to have all his students pass the end-of-course Algebra 1 exams, Greseth said. Lydia Pell loves watching her students grow and progress through the school year. As an exceptional student education (ESE) teacher, she knows not every student learns the same way, so she employs various programs and strategies to help her students achieve success. Pell said she understands her students well and structures the classroom to accommodate them, allowing students to stand up during certain lessons and walk around when needed. To ensure even reluctant readers gain familiarity with their grade level curriculum, Pell exposes students to it as much as possible and implements corrective reading strategies to help them improve. PECS provides ESE students a host of therapies, and scheduling those sessions and classroom time is an ongoing challenge for Pell. “The therapists that come here are the best of the best,” she said. Pell began her career in 1985 as an ESE paraprofessional in Lee County. While working as a paraprofessional at Moore Haven Elementary School, she earned a bachelor’s degree from Florida Gulf Coast University in 2006 and became a full-time teacher. 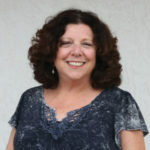 She is a certified ESE specialist and has been teaching at PECS for three years. Language teacher Jimi Huff realizes teaching an old culture to a new generation poses a challenge. But every time she hears students using Creek words in the hallways, she knows she has done her job. She said students respond best to hands-on learning, so she incorporates crafts into her curriculum. Huff also embraces technology to help pass the Tribe’s history to youth. The PECS Culture Department created a website, www.CreekCulturalEducation.com, for students as a tool to help with words, phrases, stories and lessons. Teaching Creek improves Huff’s language skills, too. Although she almost speaks Creek fluently, she sees room for improvement. She said younger kids are more eager to learn than older ones, who seem more set in their ways, but she forges ahead regardless. Before joining PECS three years ago, Huff taught at the Brighton Preschool for 10 years. She is working toward a bachelor’s degree at Indian River State College and plans to remain at PECS after earning it. Tim Thomas is a jack-of-all-trades for PECS; he drives a school bus, maintains the school grounds and buildings, coaches the girls basketball team and helps teachers with supplies and services. Thomas is proud of the girls basketball team and how well its players have performed at other schools after playing for PECS. When he sends them off to conquer the next level of the sport, he follows the careers of students like Shae Pierce, Sydnee and Darlah Cypress, and Sunny Beardon with joy. His biggest challenge isn’t with students or staff; it’s with unwanted animals, such as snakes and raccoons, that sometimes make their way onto the PECS campus. He ensures they avoid human contact. Thomas has been an employee of the Tribe since 2003 and is in his third year at PECS.